Lynn Flores is known for being highly prudent in her decision-making, passionate about her work, and deeply caring. An enthusiastic EMS professional, Lynn consistently seeks opportunities to drive improvement. 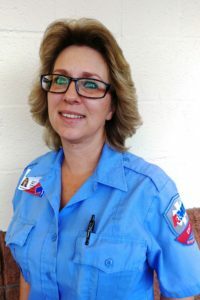 This February, EMT-Intermediate Lynn Flores and her partner noticed something strange on their way back to base: a man was on the shoulder of the highway, hitting a limp baby across the back. Lynn immediately pulled over and rushed to help the family. Lynn and her partner took turns giving the baby back blows until the obstruction was dislodged from his throat. Lynn and her partner transported the baby to the hospital, where he made a full recovery. A local news station learned about the rescue and recognized Lynn and her partner in one of its “Pay It 4ward” segments. Each person featured receives $400 from the station, which the recipient gives to a charity of their choice. Lynn donated her $400 to Carrie Tingley Children’s Hospital.